Today it is exactly two years since the weirdest Valentine's Day I have ever experienced, or indeed hope ever to experience again. February 14, 2011, in short, is etched into my diary and my brain as the day when I was diagnosed – out of the blue – with pancreatic cancer. They say one should always be grateful for what one has. Accordingly, the appropriate emotion ought perhaps to have been a feeling that I was incredibly and wonderfully lucky, because I was not dead. After all, St. Valentine died on the the 14th of February, on the Via Flaminia in the north of Rome. Hence Valentine's Day. Whereas there was I, alive and well, being told by a doctor in Sarajevo's famous Koševo Hospital – a huge complex of buildings on a hill in north Sarajevo – that a malignant tumor on the head of my pancreas was what had caused me to turn, from head to toe, yellow. Many people, so late are they diagnosed with pancreatic cancer, are dead within three months: my good fortune (for that is truly what it was) was to be told something on Valentine's Day that, had I not found it out till Christmas Day, might have had a very different outcome. I have written briefly elsewhere about how very soon afterwards I was wheeled in to an OR at the Copenhagen University Hospital for Whipple surgery, the radical procedure in which, as one fellow pancreatic survivor recently expressed it, "Everything around the pancreas that can be removed, cut, whacked, chopped, is." That operation, simply put, saved my life. It involved the removal of parts of four organs and the reconstruction of my digestive tract and was followed up by chemotherapy that lasted seven looooooong months. But two years on, here I am. I have out-lived Steve Jobs, may he rest in peace, who had the exact same surgery – though the pathology of his pancreatic cancer was somewhat different. Unlike Jobs, but in common with Patrick Swayze, Joan Crawford, Margaret Mead and Luciano Pavarotti, who all sadly lost their lives to it, my Valentine's Day diagnosis was that I was suffering from the more common form of pancreatic cancer called adenocarcinoma. The bad news about exocrine tumors like pancreatic adenocarcinoma is that they tend to be more aggressive than neuroendocrine tumors, the kind that Jobs had. The good news though is that if caught early enough they can be treated effectively with surgery. In other words, they can be resected, cut out. "All" that the patient needs is the good fortune to be diagnosed before the cancer has spread beyond such organs as can safely be resected. I had just such good fortune, and the rest is history – as is half of my pancreas, all of my gall bladder, all of my duodenum (the first section of the small intestine), a goodly portion of my common bile duct, and the distal or lowest third of my stomach. Since the overall five-year survival rate for pancreatic adenocarcinoma is less than 5%, being one of the lucky few who can have it operated into oblivion is an incredible gift. 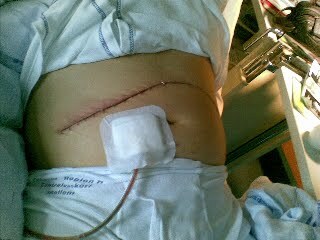 Whipple surgery is reckoned, by the Copenhagen University Hospital (Rigshospitalet) in which I had the operation, to increase the 5-year survival rate from 5% to 40%...which is an astonishing improvement in the odds. I was very happy to agree to it: I quite fancied still being alive and kicking in 2016! After the Whipple surgery, being told that your tumor has been successfully removed, and that all of the many surrounding lymph nodes also removed during the operation have tested negative for any spread of cancer, is a deeply uplifting experience. Having to undergo the physically brutal elective self-poisoning we call chemotherapy was somewhat less uplifting, but "belt and suspenders" was the approach of my team of Danish oncologists. With four children, a wife, two cats and a dog, why run the risk of the surgeons having missed a few sub-microsocopic cancer cells? Cytotoxins are nothing if not effective: besides, "what doesn't kill you, makes you stronger" – right? That is all I am willing to say about chemotherapy. Fast forward thirteen months beyond the end of that chemo, and you get to today. Pancreatic cancer survivors aren't especially numerous, for reasons that CNN spells out quite succinctly here, but that only makes it more important that we lucky ones speak out and, hopefully, embolden others to do the same. As well as saving it, Whipple surgery also changes your life, since is rearranges your innards in ways that boggle the mind when you see it spelt out in words. Digestion of entire meals is no longer an option, but a world of snacks is better than no world at all. Because my pancreas was my digestive system's main enzyme-producing organ, my aim in "Year Three" must be once and for all to master the nutritional and digestive complications of no longer having sufficient enzymes. I've not quite figured it out, not yet. This two-year milestone seems as good a time as any to share one or two images – do please let me know if you think it's true what they say about a picture being worth a thousand words. So far so good: the Whipple Surgery is complete. months after the Whipple surgery. Studio makeup is a wonderful thing! 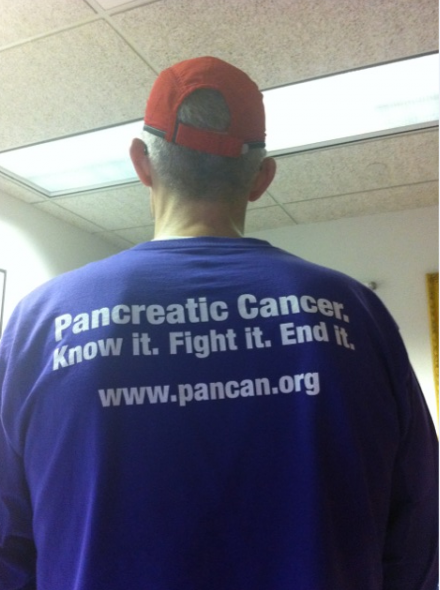 How Can We Let Even Ironman Runners Succumb To PanCan?